With Valentine's Day fast approaching I thought I would put together a fun "pink themed" post. 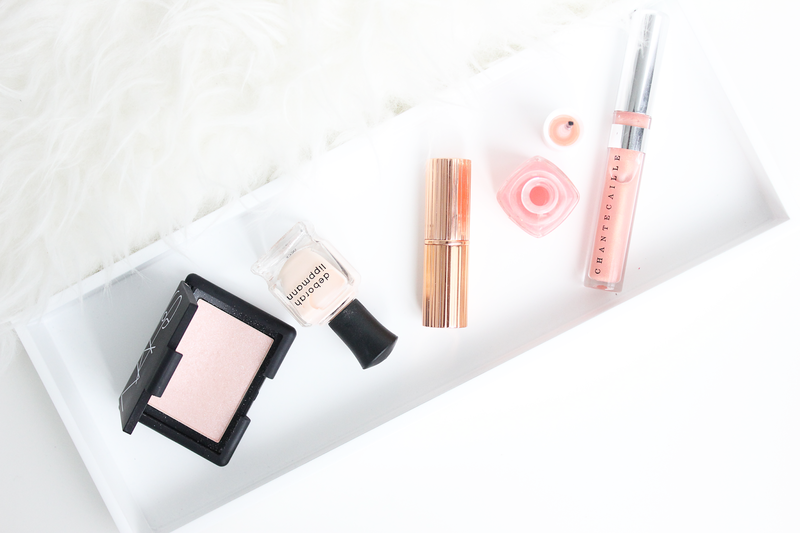 Playing off of last week's "Beauty Radar" post the colors are soft, light, and feminine. While I love a great hot pink lip (especially in the summer) my everyday-wear is far more neutral and blush tones I can definitely get behind. With so many bright pinks and reds floating around for the upcoming holiday light, airy makeup will compliment any look. Below are some of my favorite bits & pieces you can use! Let me know in the comments what blush-pink shade is your favorite and what you'll be wearing for Valentine's Day. ps: If you are craving red for the holiday (or pinks just aren't your thing), check out this post from the other week! Sounds so perfect Beti! I'm loving mauve shades on the lips as well! Pink Glove Service is such a pretty shade from Essie! I picked up this gorgeous lip butter from NYX - it's a rich, medium pink shade, with a hint of magenta in it. I can't wait to wear it! I can't get enough pink products, so this is perfect! I have the same NARS Blush and I love it! It's definitely one of my favorite blushes they've released lately! such a perfect color scheme for Valentine's Day! i love the NARS blush & an obsessed with it. such a good purchase! Such a great purchase! I love how it has the prettiest shimmer highlight! I think I've just fallen in love with your photography and your blog! Love at first sight is so fitting since it's a Valentine's Day post! :') I love the colour of the NARS blush and the CT lipstick! Thanks Becki :) heading over to check out your blog now! Great post! I love me some pinks, especially pale tones and that nail polish is definitely something I will be picking up! Pale pink is my absolute favorite! The nail colors are great - both super soft and subtle! I love all of these shades! I have been going to my basic Essie color lately - hi maintenance, for a great blush semi opaque mani. I will have to look into that lip color, you know I am loving neutrals lately! Ooh I definitely need to check out hi maintenance! I don't have that one in my collection.